In J Brand white jeans, Zara shirt, Hermès scarf and Manolo Blahnik heels. Gorrrrrrgeous - so great to see women this age wearing scarves. Feels like a dying art! Peony is gorgeous, ahhh stunning girl! @Sam @ bento- loved the way you said gorrrrrgeous! Not sure where you are from but it reminds me of Craig Revel Horwood from Strictly Come Dancing in the UK! I like her scarf - such a bright spot! she is so stunning! 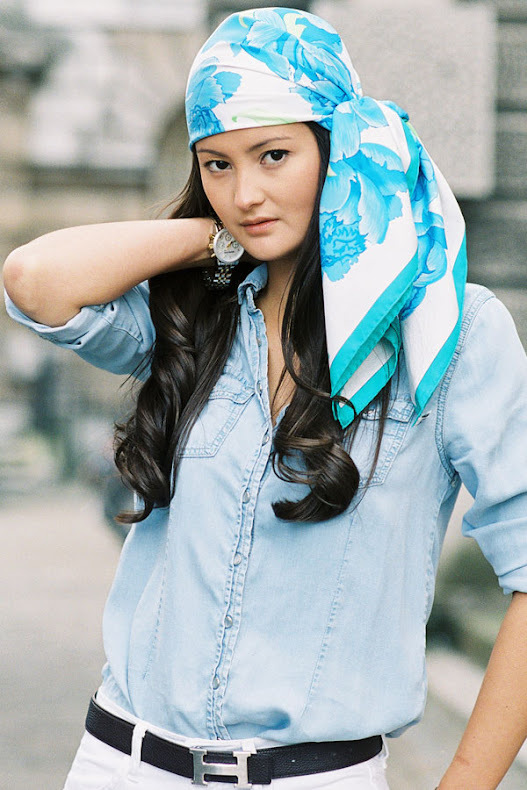 the head scarf really makes the look fun! love this shot. I love the pirate vibe of this look! I like this washed blue! I just stumbled across your blog. Lovely photography and subjects. I'm a follower now. She is gorgeous, love the Hermes scarf!!! Thanks everyone! I am sure Peony will have read your comments! love hermes scarves!!! wish more young people would wear them like this.